The Government will spend around £24m more on Armed Forces pay after accepting the recommendations of the independent Armed Forces' Pay Review Body, Defence Secretary Dr Liam Fox announced today. All servicemen and women earning £21,000 or less - around 50,000 members of the Armed Forces - will receive an increase of £250 to their salary. The Operational Allowance has also been doubled to £5,281 for those on a six-month tour. Other key recommendations include new targeted measures designed to retain personnel essential to key operational capability, including new levels of specialist pay and financial retention incentives. For example, specialist pay for explosive ordnance disposal (EOD) operators will be restructured with the introduction of a new level and other levels increased. 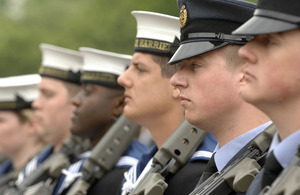 The recommendations from the Armed Forces’ Pay Review Body (AFPRB) will be implemented in full from 1 April 2011. Our Armed Forces make great sacrifices for this country and nobody deserves a pay award more. Despite inheriting a tough financial situation I am glad that we are still able to award this increase to the lowest-paid servicemen and women. We’re tackling a difficult economic situation, but we’ve managed to double the Operational Allowance and boost specialist pay for those such as EOD operators to recognise the unique work they do. a minimum of £1,218 in Longer Separation Allowance over a six-month tour. The AFPRB is an independent group comprising nine members and the chairman, Professor Alasdair Smith. It reports annually on levels of pay for the Armed Forces. The AFPRB bases its recommendations on broad comparability with similarly weighted civilian jobs. The review body gathers evidence from a wide variety of sources and takes account of a number of factors including government evidence. The AFPRB report, which includes details of their recommendations and annual pay rates, is available at the Office of Manpower Economics website - see Related Links.